With Fluenz, you will see beautiful and charming language teachers like Sonia Gill. 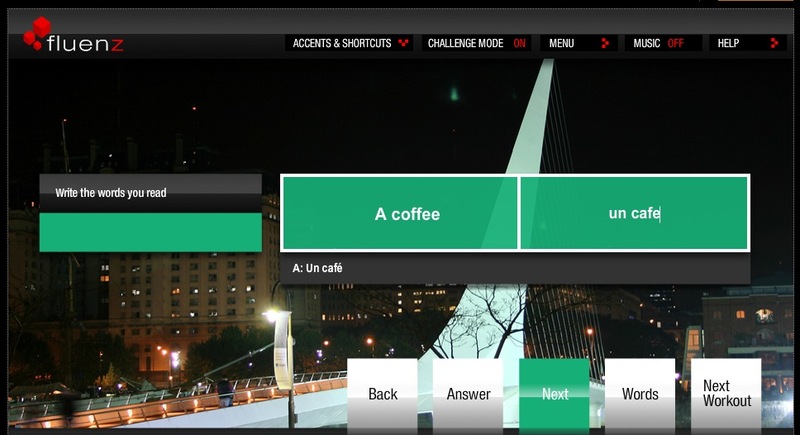 Fluenz is a computer program for learning foreign languages that attempts to simulate a one-on-one tutoring session. Like tutoring, Fluenz is slow. 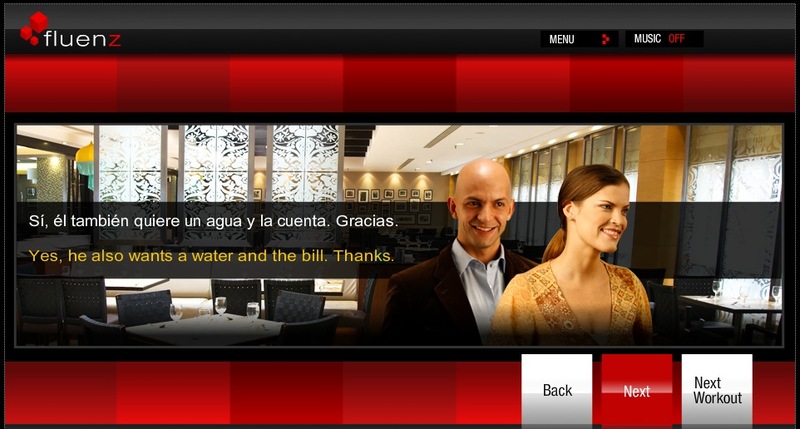 However, if you spend enough time using Fluenz Spanish, for example, you will learn some Spanish. Fluenz does a competent job of simulating a high school or university language class. It’s probably a very good choice for students who need to “pre-study” before they take a beginning Spanish class in order to be sure of getting an A and keeping a great GPA for getting into the professional school of their choice. Fluenz is not the best choice for people who for example want to learn Spanish before they take a vacation to a Spanish speaking resort area like Cancun, Mexico. The demos that are linked from the flags below are a better choice for getting you from nothing to being able to converse in the marketplace quickly. If you are considering some of the other popular foreign language learning programs you will probably want to read what I think about Duolingo and the ever popular Rosetta Stone before you decide which one is right for you. If your language is not linked to from the flags above, please continue reading the Fluenz review below. There is a link to the list of languages Fluenz offers at the bottom of this review. Please read the full review below and leave your insightful comments at the bottom. Thank you. Most Fluenz study screens have annoying background music. Fortunately you can turn it off by clicking on the top right of the screen. Everyone who has ever learned a language has a favorite learning method. They know what worked for them, and they are often wildly enthusiastic about it. For example, the original Rosetta Stone program was written by a man who was trying to simulate the experience of learning German while living in Germany. At Language101.com we have had great learning experiences using spaced repetition, and those experiences definitely influenced our software. Sonia Gill and her friends at Fluenz must have had great language-learning experiences at Cornell University. So, naturally, the Fluenz team developed a language learning program that attempts to simulate tutoring, and perhaps it also attempts to simulate a university language classroom. Well, sort of, maybe it does, but I’ve never had any of my language tutors ask me to play simple “match the foreign phrase to the English phrase” computer games and fill-in-the-blank computer games like the ones Fluenz uses. On the other hand, high school and university language teachers are madly in love with that kind of computer game. Fluenz includes the common “drag the phrase on the left to its meaning on the right” game. Fluenz works by mixing on-screen video of a foreign language teacher explaining what you are supposed to learn with animated foreign-language words and simple phrase-matching and fill-in-the-blank computer games. Their teachers are all beautiful people like the lovely Sonia Gill, and the explanations are clear and useful. If you go through the exercises enough times, you will slowly start to remember what you have seen, heard, and said. Before the age of recorded language-learning materials, if you wanted to learn a new language and didn’t live where it was spoken, you could either try learning it from a book (good luck) or hire a tutor to teach you. European kings used to hire language tutors to teach their children. If you work with a tutor seven days a week for at least two hours each day (four to six hours would be better), you will gradually learn your new language. I have friends who have learned languages that way, and if you do it at least five days a week (seven is better), it will work. On this screen I was stuck because I couldn’t type the proper accent mark on my English keyboard. You can turn off this feature by clicking on Challenge in the top middle of the screen. Fluenz has alternate methods of entering Spanish letters and accent marks. This is a ten-thousand-year-old method, or maybe it’s older than that, and Fluenz is simulating it fairly well. One-on-one tutoring can be simulated with a computer. Other effective language-learning methods like real language immersion (twenty-four hours a day, seven days a week) cannot be simulated with software. That’s why Rosetta Stone (which is trying to simulate language immersion) basically doesn’t work. Fortunately, in an industry where lies and damn lies are the norm, Fluenz says on their Web site: “We know that learning languages isn’t easy.” Wow, what a breath of fresh air! Fluenz doesn’t make any wildly impossible claims like the ones made by Pimsleur Approach that you can learn a language in ten days, and there are no claims like the ones Rosetta Stone makes that you will learn effortlessly like a child. Fluenz says: “We’ll be honest when there are real challenges, and we’ll work with you to get through them.” They are 100-percent right that there will be challenges. It takes a lot of consistent hard work to learn a new language, and Fluenz is being honest about this. I’m delighted. I do have one small gripe about their marketing claims. They claim that their Portuguese program will let you understand and be understood in Brazil, Portugal, and the African countries where Portuguese is spoken. This is probably only true for reading and writing Portuguese. I have a lot of Brazilian friends and a few Portuguese friends, and they all say that they can only barely understand each other, sort of like an Italian talking to a Spaniard. Eventually they get the point across, but it’s not easy. In other words, Brazilian Portuguese and European Portuguese are, today, really two different but highly related Romance languages. Fluenz offers Brazilian Portuguese. Since Fluenz is attempting to simulate one-on-one tutoring, it’s not going to be any faster than old-fashioned one-on-one tutoring. In other words, it is a much slower method than is possible with modern software. It’s a good program that is well developed, but it’s still relatively slow compared to what is possible today. I’m writing this from the lovely town of Antigua, Guatemala, where there is a Spanish school on every corner. Students come here and spend between two and six hours per day with one-on-one tutors teaching them Spanish. Tutoring does work, but you need to plan on spending a lot of time each day with the tutor (or the simulated tutor), just like the students in Antigua do. With Fluenz, there is no attempt to understand how forgetting works, and how it is today’s learning minus today’s forgetting that really counts. To understand how much you can learn and how much you will remember in 30 minutes with simulated tutoring, try the free Fluenz demo for 30 minutes, then try the free demo at Language101.com for 30 minutes. See which one of them helps you remember more Spanish the next day. If your goal is to learn to speak and understand a new language, you will learn faster (and forget slower) with Language101.com. Do You Need Great Explanations? Fluenz seems to think having teachers explain things is essential for language learning. This is a fun idea that might seem obviously true, but actually it isn’t true. Now there is nothing wrong with having a nice teacher explain things. It’s not a bad thing, don’t get me wrong; it’s just not an essential thing. For example, say that you have an hour to devote to studying a Spanish verb. You could listen to a nice teacher explain all the rules of this verb, or you could simply spend your hour memorizing all the variations and forget the rules. For the explanations of the teacher to do any good long term, you need to be able to remember them long term. One-time explanations by a wonderful, compassionate tutor like Sonia Gill are not much more likely to be remembered than one-time explanations of a new foreign-language phrase by the same tutor. In other words, great explanations, while fun, are much less important than learning the right material and remembering it. Say that you are a native speaker of English and you need to take a university class in Spanish (and get an A) because you want to go to medical school or graduate school. Fluenz would make an excellent summertime pre-study tool to prepare you to take a Spanish class in the fall. Remember that a lot of bilingual native speakers of Spanish will be taking beginning Spanish just to get an easy A, so your competition will be native speakers of Spanish. In this case, I would highly recommend buying Fluenz Spanish and going through all the levels before your class starts. Fluenz would also be a good supplemental study program for people enrolled in a Spanish class who don’t really like the learning materials that their school has to offer. Remember that schools basically grade you on your ability to read and write, not your ability to speak and understand. Fluenz will help you learn to read, write, and spell. Language101.com is faster for speaking and understanding languages, but Fluenz will teach you to read, write, and spell too. Language101.com doesn’t teach writing or spelling at all, and only teaches a little bit of reading. Our focus is on teaching you to speak and understand Spanish or your other new language. People who only want to speak and understand their new language should buy Language101.com by itself. People who want to speak and understand a new language and also learn to write it and spell it should buy Language101.com first, and then after they can speak and understand some, learn to read and write with Fluenz. To try the Language101.com demo . . . If you’ve read the Fluenz review and you think it might be right for you, you might want to try their demo. Look for the language you want to learn at the top left of their home page under the tab that says Languages. I wrote this review because I am a wild enthusiast for language learning, and the people at Fluenz clearly are too. While the Language101.com program is a lot faster than Fluenz for most learners, Fluenz offers different languages and different features than we currently do. At Language101.com we always want you to spend your time with methods that work, and if you have enough time, Fluenz programs will work. If you found this review helpful, please copy and paste this URL into your web page, or on Facebook. If you liked this Fluenz review, please share it with your friends on Twitter by tweeting the message below.